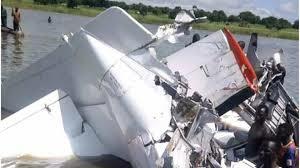 South Sudan: Plane crashes into Lake Yirol ‘killing 19’ – Royal Times of Nigeria. At least nineteen people died in South Sudan today when a small aircraft carrying passengers from capital Juba to the city of Yirol crashed. State information Minister Taban Abel said there were 22 people on board the flight that departed Juba International Airport in the morning. Abel added that three people, including one child and a co-pilot, were rescued from the crash. The minister said authorities were investigating the cause of the crash.